The UJA Federation of New York is the world’s largest community based philanthropic organization that raises funds to sustain more than 100 health, human-services and community building agencies. http://www.ujafedny The Hilibrand Autism Symposium at the UJA Federation of New York is one of Autism’s cutting-edge annual events that brings together scholars, news-makers, community support systems and service providers. Combine all three of these forces and the result is certain to ignite ideas, and in this case, directed specifically towards programs for adults living with ASD. During last Spring’s Hilibrand Autism Symposium all three organizations announced the creation of The Daniel Jordan Fiddle Foundation Ignition Grant Award for Innovative Young Adult and Adult Autism Services. (DJF Ignition Grant). At this year’s upcoming symposium scheduled for April 25th in New York City, the first program to receive this award will be unveiled. The DJF Ignition Grant is designed to stimulate the development of an innovative program for adults living with ASD or young adults as they transition to adult life (age 16 or older) by encouraging UJA Federation of New York agency organizations to submit proposals to develop, create and sustain new ideas. The DJF Ignition Grant award that is matched by UJA Federation of New York, provides seed money to pilot a new idea in the field of adult Autism to enable people in this age group to have access to opportunities that will allow them to achieve additive levels of independence. The program idea can address any area relating to adult life including social skills, employment, education, social/sexual development and housing/residential initiatives; no matter what the program , it must push the boundaries of what is already available at UJA-Federation agencies in New York and capitalize on unrealized potential. The first DJF Ignition Grant recipient fulfills the goal these organizations imagined and that adults living with Autism have been asking for: a program to help them form, maintain and navigate healthy interpersonal relationships. 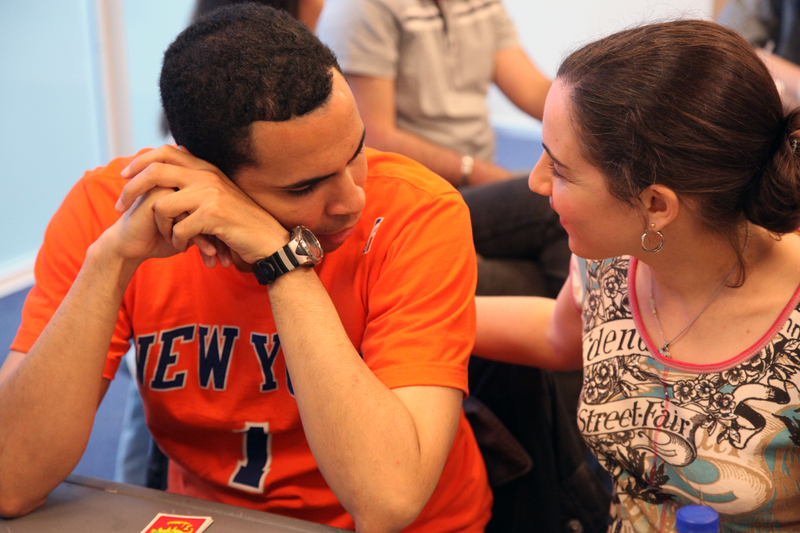 The JCC in Manhattan is the recipient of this $10.000 grant that expands it six year old Adaptations program geared towards adults in their 20s and 30s and creates four different social support groups for adults on the spectrum. Groups are co-facilitated by experienced professionals, consist of 8 to 12 individuals and meet every other week for one/two hours . The focus of this new program, which interestingly addresses issues raised in Amy Harmon’s New York Times front-page story, “Navigating Love and Autism,”, is on sexuality, dating and intimacy offers a supportive and safe setting to explore these topics . The Social Learning Support Group, one of the four groups in the program, is geared towards young adult participants with an Asperger Syndrome diagnosis. In this group, participants learn and practice navigating social situations such as body and volume awareness, self advocacy, dealing with anxiety conversation skills and developing friendships. Group members have the opportunity to apply the skills discussed out in the community. Participants also receive individualized support within the context of the small group. The Social Learning group now has 12 active individuals with a facilitator from the Mount Sinai Seaver Center and an intern from Adaptations who is with the group for her second year. Additionally, the group has two other interns involved. The group now meets for an hour and a half; thirty minutes are spent discussing a particular lesson with the entire group and an hour is used for small groups discussions. This new Social Learning Support Group has created a space for its participants to socialize, learn and grow together. The GirlFriends Group is another support group in the program and brings girlfriends, in this case young women on the spectrum, together to experience the bonds of friendship through laughter, tears and advice when needed . Having a strong network of girlfriends makes women healthier, happier, more successful, less stressed and more confident. The GirlFriends Group helps participants establish lasting friendships. There are currently 9 regular female participants who are benefiting from the group’s work on navigating the social complications of female friendships. The Dating – On and Offline Group has been quite an experience and experiment according to the program facilitators. After several years of hearing about people’s desire to date and discussing dating issues one on one with participants, Adaptations is finally able to do so in a group setting. This has allowed participants to receive help in creating their own dating profiles, and explore issues of boundaries and safety when dating online. Participants have expressed that they now feel more comfortable dating on line. This group has also allowed for the creation of a forum for the participants to start asking questions that they have kept inside for so long and to gain support from their peers (eg:“How do I ask someone out on a date?” “How do I know if they like me?”, or “ How do I know when it is appropriate to kiss my date?” etc.) This group is still in its infancy phase where people are just excited to have a place to ask questions, feel validated in not knowing the answers, learn how to better understand social cues and ultimately improve their self confidence. The fourth support group in the program ,that is still in formation, will focus on building confidence in dating and social relationships in the context of the larger community outside the program. Other future avenues for this DJF Ignition Grant program include dating and mingling events and the implementation of a safe, secure on-line dating website just for program participants to use within the confines of the program. To achieve this part of the program, a partnership with Pace University and the Seidenberg School of Computer Science and Information Systems has been established. Pace Assistant Dean and Director of Special Programs and Projects has agreed to take on this project and has began development of the site along with the experts Adaptations. The Daniel Jordan Fiddle Foundation, UJA Federation of New York and the Hilibrand Foundation are looking forward to the growth of this first Ignition Grant Program and aspire for it to serve as a model for the development of similar programs in communities everywhere.